Bibionidae (March flies and lovebugs) are a family of flies (Diptera). About 650-700 species are known worldwide. 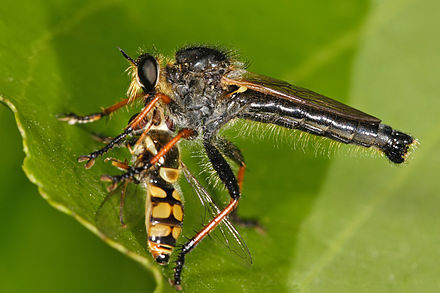 Bibionidae are medium-sized flies with a body length from 4.0 to 10.0 mm. The body is black, brown, or rusty, and thickset, with thick legs. The antennae are moniliform. The front tibiae bear large strong spurs or a circlet of spines. The tarsi are five-segmented and bear tarsal claws, pulvilli, and a well developed empodium. The wings have two basal cells (posterior basal wing cell and basal wing cell), but are without a discoidal wing cell. R4+5 is simple or branched; at most, only three branches of R developed. The leading edge wing veins are stronger than the weak veins of the trailing edge. Bibio pomonae: Note the stout body, short, thick antennae, the powerful femora and spined tibiae of the dichopotic female. The male is holoptic. Plecia (lovebugs) spend much of their adult lives copulating. The male and female (lovebugs) attach themselves at the rear of the abdomen and remain that way at all times, even in flight. Adults swarm after synchronous emergence, sometimes in enormous numbers. Palaearctic Diptera with Special Reference to Flies of Economic Importance. Science Herald, Budapest, 565-649. ^ Bollow, H. 1954. Die Landwirtschaftlich wichtigen Haarmticken. Z. PflBau PflSchutz 5 (49): 197-232. ^ Maier-Bode, [-]. 1936. 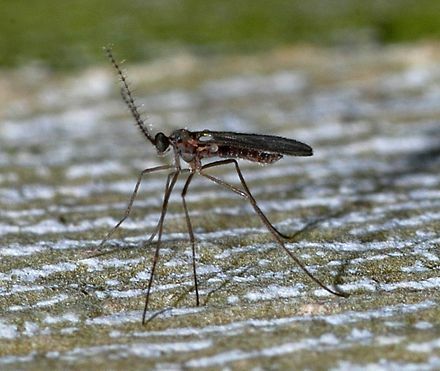 Die Gartenhaarmticke (Bibio hortulanus) als Roggen-schiidling. NachrBl. dt. PflSchutzdienst., Berl. l6: 10. ^ Spitzer, K. 1966. An example of severe damage to planted potatoes by the garden March fly (Bibio hortulanus L.) [in Czeckoslovakian]. Ochr. Rost. 2(39):81-82. ^ Strickland, E. H. (1916). "The March fly (Bibio abbreviatus) in grain fields and as a pest of celery". Agric. Gaz. Can. 3: 600–603. Wikimedia Commons has media related to Bibionidae.